General Kayani’s treachery knows no limits and he is working now to establish American military bases permanently on the doorstep of this Ummah’s only nuclear power, Pakistan. 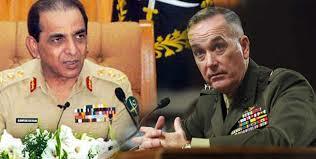 On 25th May 2013, General Ashfaq Pervez Kayani met ISAF Commander Gen Joseph F Dunford in GHQ Rawalpindi. According to an ISPR statement during the meeting General Kayani pledged Pakistan’s support to the US for establishing peace in Afghanistan and the withdrawal of NATO forces from Afghanistan. This meeting was part of a series of meetings and efforts which American’s Chief Guardian in the region General Kayani has done with various US and Western officials and international institutions in order to strengthen America’s faltering control over Afghanistan. On 20th May 2013 General Kayani organized an international symposium on Improvised Explosive Devices (IEDs) in GHQ Rawalpindi aimed at devising a policy to curb flow of fertilizer to the Muslim resistance in Afghanistan. According to US Military estimates 80% of the Afghan bombs are made out of fertilizer and around 60% of US casualties in Afghanistan are due to IEDs used by those fighting the US occupation. As well as taking help from his small club of traitors within the military leadership, General Kayani has enlisted the support of traitors within the political leadership. So, Nawaz Sharif and other “politicians for sale” are now trying to pressure Muslims to lay down their arms and accept the crusader presence. Operations in Karachi and Quetta are part of this strategy to pressurize the Muslims. All this is in addition to Kayani’s purging of officers opposed to the American Raj, protecting the NATO supply line and establishing drone attacks within Pakistan. General Kayani and his accomplices within the political and military leadership are trying to fool the people of Pakistan and its armed forces by suggesting that they are actually helping America leave the region. These American agents sense the anger amongst the Muslims of Pakistan and Pakistan’s armed forces and know that the noble Muslims of this country have come to regard American presence in the region as a direct threat to themselves and their Deen. So America allows these rulers to pretend as if they are fulfilling the wishes of the people, whilst they are actually strengthening the American presence here by helping her establish permanent military bases in Afghanistan, under the veil of negotiations and partial, limited withdrawal. Such is the reality of the traitors’ double game against the Muslims for the sake of their kuffar masters! O Officers of the Pakistan Armed Forces! The conduct of your rulers is before your eyes. They rushed to help America establish a foothold in this region by opening Pakistan’s Airspace, waters and land routes for her so that she can invade Afghanistan. They started chasing the mujahideen in Pakistan’s tribal areas and cities, arrested them and handed them over to the US. Then when America’s grip started to falter in Afghanistan, they moved Pakistan’s armed forces in to the tribal areas to stop the fighters from going to Afghanistan and ignited a war of fitna in Pakistan, whose fuel has been the noble blood of Pakistan’s armed forces and its people. And now rather than combining the armed forces with the resistance as one hand against the cowardly crusaders and their failing occupation, they are pressurizing the resistance to lay down their arms! O Brothers! Grant Nussrah to Hizb ut-Tahrir and pledge bayah to the eminent scholar and statesman Sheikh Ata bin Khalil Abu Rashta, the Ameer of Hizb ut-Tahrir, for the immediate establishment of the Khilafah in Pakistan and the end of the humiliation of this Ummah. It is time brothers, to be a frontline state not in America’s War on Terror, but a frontline state of the Ummah, of Islam and of Allah SWT and His Messenger SAW. Hizb ut-Tahrir is calling you, so all those of you who have yet to respond must now respond!